Gin's showdown with the evil Fire elemental Mab Monroe has been building since the first page of book one (Spider's Bite), and I have been waiting with bated breath for Gin to kill Mab, slowly and with a great deal of pain. Whew! I sound almost as bloodthirsty as Gin, but if you've read any of the books in this fantastic series you most likely feel the same way. Mab puts the 'E' in evil, and it's high time she gets what she deserves. Gin is the Spider, and her reputation as an assassin is unparalleled. She has been patiently planning her nemesis, Mab's demise ever since Mab killed Gin's mother and sister when Gin was thirteen years old. Just like the spider she's named after, Gin knows that her patience will pay off when it comes to getting her prey. So when she blows a prime opportunity to assassinate Mab, Gin knows that she is going to have to work harder the next time...if the score of professional bounty hunters--- that Mab has brought to Ashland to hunt down Gin and her sister Bria--- don't get her before she gets Mab. The last thing Gin wants to do is put those that she loves in danger, but they refuse to let her take on Mab alone. She is as about as tough as they come---hello, she's an assassin---but when it comes to her friends, her foster brother, her baby sister Bria, and her lover Owen Grayson, her heart is marshmallow soft. But Gin has to push those feeling deep down and become the cold-hearted, nerves-of-steel Spider if she is to defeat Mab and save those she loves from certain torture and death. The next book, By A Thread, will be released in March 2012 and the seventh book, Widow's Web is set to be released in September 2012. In order to get maximum enjoyment from this series, I recommend reading them in order: Spider's Bite, Web of Lies, Venom, Tangled Threads, and Spider's Revenge. I know I've said it before, but it bears repeating, this really is the best urban fantasy series out there. It is entertainment at it's best. I have the series on my list, but I have not yet begun to read it. I must. Marybelle, it is so fantastic! I don't know that I'd say it was the best, but it's definitely up there. I'm with you--I love this series. 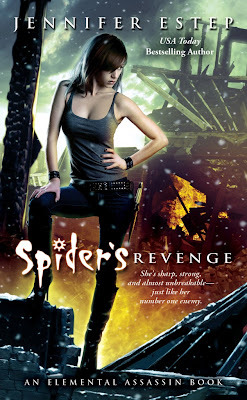 Just finished reading Spider's Revenge, too. Thanks for a great review. Mary Ann, it is pretty hard to put down. LSUReader, it's definitely one of my favorites. Wonderful review, Gannon, thanks. I really have to put this series on my list! I have one of the earlier books in the series, but it is still on my TBR mountain. It definitely sounds like a series that needs to be read in order. I have not read much urban fantasy and this sounds like a good set to start with. Thanks for the review and recommendations. This book looks great! Cool cover!